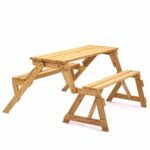 The highly durable pub style outdoor picnic table bench is a great choice when it comes to buying a table and chairs set for your garden. It’s perfect for BBQ grills, gatherings, browsing on your laptop or anything else. All of the picnic tables conveniently have a hole in the middle so you can stick a garden umbrella in to provide shade when you need it. 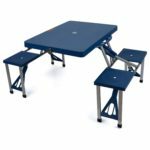 When it comes to buying an outdoor picnic table with benches or chairs, you usually have to decide whether you prefer a non-folding or folding picnic table, each one will have their own benefits. 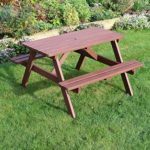 For those who are not keen on the wooden picnic table designs or if you’re a D.I.Y enthusiast, then perhaps you can try to build a picnic table yourself. It’s not too difficult to build a picnic table yourself when you’re given instructions, you’ll also feel proud if it’s successful. 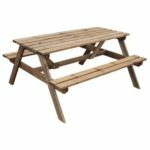 However, for those who don’t have the time or just hate D.I.Y, investing in an outdoor wooden picnic table is not too costly and it’s built to last as well. Another great option could be to buy a 3 piece bistro set which is ideal for smaller spaces, many models can also be folded away. Although a garden picnic table accommodates for more users, a bistro set has a more elegant look and can enhance the appearance of your garden, balcony or patio. 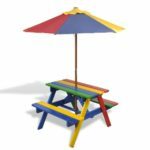 Whether it’s a wooden or plastic picnic table, there are several factors to take into consideration when searching for the best picnic table. Material – There’s a wide range of materials to choose from, including different types of wood, plastic and polyethylene. Each material will have its own advantages and disadvantages. Wood will be strong and durable but heavy, whereas plastic will be weaker and won’t be able to support as much weight but it’ll be lighter and more portable. Folding – None of the wooden picnic bench tables shown in our table have the ability to fold up so it can be put away tidily or in storage. 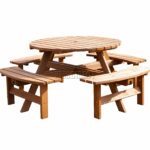 Fold up picnic tables are usually non-wooden as the design and material allows it to be foldable. We’ve compared the two types below so you can decide which one is best for you. Seats – Is the picnic table going to be for just the people in your household or guests you’ll be inviting over? Knowing roughly the number of people you’ll need to accommodate for will give you an indication of what size picnic table you should buy. For a picnic table with benches, depending on the size of the users, you might be able to utilise the full length of the bench and squeeze more people in. Whereas with a picnic table with chairs you can only fit one person on each chair. 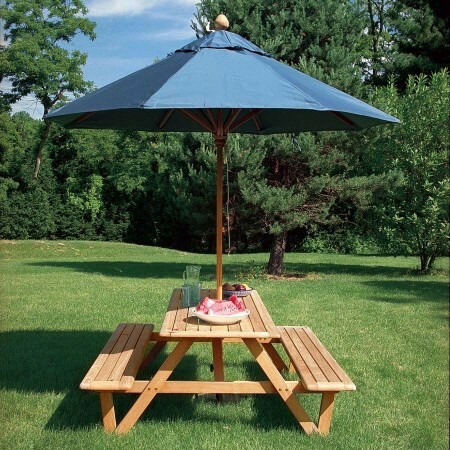 Parasol/umbrella hole – The hole in the middle of the table is meant to be for an umbrella parasol, this will provide the needed shade from the sun or shield from the rain when you need it. 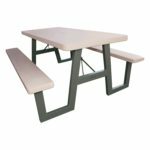 Dimensions – For the picnic tables that are not foldable, you’ll have to find it a permanent home so check the dimensions to see if it fits well in the designated location. 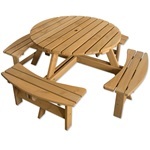 Kids picnic table sets will have smaller dimensions to accommodate for their size. 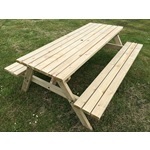 Weight – A heavier picnic table bench will probably imply that it’s sturdier, however if it’s not a fold up picnic table then moving it from one place to another in the garden may require more than one person, as non-folding tables tend to be heavier. Can’t decide between a non-folding or folding picnic table? Don’t worry there are many people who contemplate on this too, this is the reason why we’ve listed the pros and cons on each one. 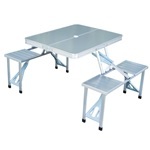 Usually stronger and sturdier with the Lifetime picnic folding table model being an exception. Larger models available so it can seat more people. Has a much higher maximum weight limit. Weighs more, therefore more difficult to move it from one place to another. Has to remain permanently at home, can’t be taken away for trips. Folds up to save space when the table set is not in use. Can be put away in storage when it’s not in use. 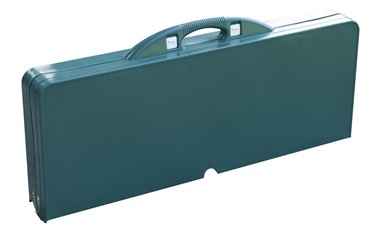 Portable and lightweight so it can be taken away for trips such as camping or fishing. Structure tends to weaker and can’t support as much weight. It will usually come as a set of table and chairs rather than benches, chairs can only fit one person.